[Updated] It won't be long before a visit to your favorite Wisconsin State Park could feel like something between a trip to the mall or an afternoon at the auto show. Remember that Walker and the GOP-led Legislature deliberately hamstrung Wisconsin Department of Natural Resources operations by cutting programs and personal, hence the announcement by the shrinking, short-handed agency that businesses could soon be drafting their own environmental permits. Austerity fuels privatization of public resources, no? And you're likely to see more of that because Walker and the Legislature also slashed state parks operating dollars from the 2015'-17 budget, so the short-staffed and cash-starved DNR is likely to sell naming rights and make other 'partnership' agreements with businesses to keep state parks up and running. Wisconsin will consider selling naming rights to state parks to help them operate without tax support as proposed under Gov. Scott Walker’s biennial budget, Department of Natural Resources Secretary Cathy Stepp told lawmakers Tuesday. Stepp said partnerships and sponsorship agreements with the private sector would be discussed over the next two years. * Why not get rid of the revenue-neutral name of, say, Peninsula State Park in Door County, and let a car dealer or herbicide company or department store chain or oil pipeline company put its name at the entrance, and further brand the property as a theme park? Can't shopping or ideological indoctrination go in hand with camping, swimming and hiking? 10:35 p.m. update - - A sharp-eyed reader/historian told me that there was an effort to buy the naming rights to Peninsula State Park for $25,000 - - and the 1911 State Legislature returned the hopeful donor's money. * Similarly, break the logjam caused by competing use and development plans for a big, DNR-managed property in the Baraboo Hills by selling the naming rights to an ATV manufacturer. That would pick a winner among the use competitors and could also let the naming rights winner build a showroom, sales department and a test-ride track there. If the birdwatchers can make a better offer, fine, but remember, this is Wisconsin, 2016, where money talks. * By the same token, who would object if a big cattle feeding operation near a state park is willing to pay to put "A little extra protein in the groundwater won't kill you" stickers on the drinking fountains. * Let trade associations put members' logos and slogans on information kiosks at trail heads and on mile markers and in visitor centers and restrooms that offer catalogues and shareholder reports instead of those old-timey, generic state booklets with pretty pictures of wildlife that don't sell any products. And don't overlook the small stuff, like adding a string of pharmacy or supermarket coupons to your park entry receipt. Go for it if there is a tie-in to the park's new corporate sponsor. A happy Wisconsin family returns home from a weekend in the woods with a dollar off two 12-packs of soda. We thought the scandal-ridden Wisconsin Economic Development Corporation was the key-pro-business Walker remake of the Department of Commerce he wiped out in the early days of his administration. An even more blatant, self-policing business friendly 'reorganization' of the Wisconsin Department of Natural Resources coming from Walker on top of a) an earlier pro-business DNR 'reorganization' scrapped in 2011, but refined, and b) last year's budget-slashing, science-trashing do-over which won the praise of the Wisconsin Manufacturers & Commerce. This new 'reorganization' or 'streamlining' or whatever corporatized talking-point you want to affix on it more firmly redefines the DNR as the"chamber of commerce mentality" state authority he promised when elected to replace and privatize the DNR's key public policy and input mission. The demolition of the DNR's public purpose reminds me of some State Supreme Court language decades ago which explained and defined the DNR's key public policy role in protecting the people's water rights - - the Public Trust Doctrine (note: copy and save) - - in Article IX of the Wisconsin State Constitution. And to understand how Walker and his party are systematically targeting that very Public Trust language with the giveaway of the public's water and its oversight. And to understand why pollution of your waters is on the rise in Wisconsin. And to understand why you as a citizen would end up on an agency do-not-respond blacklist if you asked the DNR too many questions. And to understand why you as a DNR employee would be severely criticized by your bosses if you gave citizens too much public information. I'd noted Wednesday that the DNR was getting ready to free some regulated businesses from pollution scrutiny. The Journal Sentinel amplifies the reporting today, noting that businesses may soon be drafting their own environmental permits. Oh, boy: Yes, the DNR - - this big business/rubber-stamping DNR - - would have to approve the plans, but it's the ultimate corporate scenario: business gets to write The Plan, and if bad things happen, they can fall back on the 'we-followed-The-Plan-and-the-DNR-approved it'' message. Talk about a dreamy 365 straight days of CEO Christmas every year - - with presents under the tree of their own choosing - - because their bean counters and shareholder services folks and PR personnel would be writing the rules under which the business would most likely intersect with the rest of us and our shared, but apparently outdated rights to clean air and water. It's akin to the Wisconsin Supreme Court having adopted a code of conflict-of-interest recusal standards written by some of the major corporate donors which heavily donated to their election committees - - a new fox-in-the-hen-house permitting process that would be a quantum leap backward from a baseline DNR and government function - - acknowledging that there is a public interest worth protecting. But it should come as no surprise that this administration would mandate - - unless the Legislature steps in - - that the DNR shed some basic functions while pitching the changes as just another round of streamlining and cost-cutting. We've heard this word-smithed, intentionally distracting loop for years. Look: If you jam a government agency by deeply cutting its revenue and creating artificial staff and budget shortfalls - - 'look, we're understaffed, so let's privatize!' - - then of course Walker would green-light business self-regulation and the farm-out of DNR traditional programs in the name of austerity - - however manufactured. While giving special interest and donor constituents the basic profit-and-power-driven-deregulation they crave and gift-wrapping it in ideological rhetoric to rig and validate the need to further shrink government and ultimately bury it. From his administration's early days, Walker remade the DNR into something of a private sector subsidiary - - much as he did when morphing the Department of Commerce into the business-tailored but scandal-ridden Wisconsin Economic Development Corporation - - to be managed by "chamber of commerce mentality" officials who oversaw a steady drop in staff and pollution enforcement actions. You could not have missed Walker's early, dismissive gesture towards the DNR's public mission when he terminated an ongoing permit review so a campaign donor/developer could more quickly build on a wetland near Lambeau Field. He pushed hard for a sweetheart iron-mining law that puts land and water at risk, and has signed or backed bills and policies that will slow down the elimination of stream-choking, phosphorus-fed algae, ease building on wetlands and shorelines and enable the siting of sand mines or the expansion of industrial-scale livestock-feeding operations that disregard the impacts on a clean environment, or neighbors, or shared water rights. Pretty soon we'll have a DNR whose sole function is issuing fishing and hunting licenses, but you have to wonder when Wisconsin's official tilt towards polluters is going to end those days at the beach, walks in the woods, ritual hunts and summer casts for walleye and bass. * The NRB's core role as citizen sounding board and policy/decision-maker was nearly wiped out when Gov. Walker proposed in his 2015'17 state budget that the NRB be diminished to advisory status, subservient to the DNR run by Cathy Stepp, Walker's hand-picked DNR Secretary with the requisite "chamber of commerce mentality." If there hadn't been a broad legislative and grassroots uproar, it's likely that the controversial land sales - - including trout stream feeder ponds and, elsewhere, shoreline access sought by a major Walker donor - - would have been approved administratively at the powerful, top-down DNR envisioned by Walker and implemented by Stepp and her top managers. Talk about putting "Deregulated" as the "D" at the DNR. * The DNR has been radically transformed into a business-friendly agency, has intentionally weakened its public-interest enforcement role and is even preparing to let the regulated write their own rules. Though the implications can seep and flow downhill and downriver to wells, lakes, beaches, trout streams and water taps. These retreats from historic DNR expectations and a basic constitutionally-defined mission - - Wisconsin's Waters Belong to Everyone - - again underscore how greatly we miss the Public Intervenor's Office - - a small group of lawyers within state government created in 1967 by Republican Gov. Warren P. Knowles to protect common resources and promote fair play in Wisconsin environmental matters. A great 2004 essay on the subject remains, lamentably, quite relevant today. I mean, who knew he had a university? How dare lame-duck President name new Librarian of Congress? I mean - - jeez - - it's the Librarian of Congress. Arthur J. Harrington, a lawyer and a member of the Environmental and Energy Strategies Group, manager of the Renewable Energy Team at Godfrey and Kahn, will talk about the Clean Power Plan and how it will control CO2 emissions in Wisconsin. After Harrington's presentation, representatives from the Wisconsin League of Conservation Voters, RENEW and 350.org will be there to discuss how you can help put pressure on Governor Walker to start the planning process for meeting the requirements of the Clean Power Plan. Keep in mind that Walker has blocked solar and wind initiatives in the state, and that cleaner air means cleaner water, too. The current Governor and Legislature have been devaluing science, public education, the UW system and Madison in general, so it must be frustrating for the ruling party to read that three UW-Madison professors have won prestigious fellowships that keep putting Madison on the map. Update - - headline corrected. Don't get me wrong: public water rights and land ownership, development planning, local citizen control and clean air are being obstructed or given away repeatedly by a corporately-controlled Governor and Legislature embedded through gerrymandering, but a couple of good things have happened lately that suggest the powers that be are not immune to grassroots and media pressure. Maybe, just maybe, Wisconsin traditionalists - - anglers, hikers, small-town board members - - can be heard by policy-makers over trade association lobbyists and insider-donors. * For now, it appears that a DNR plan to sell some public land along important waterways has had politically-charged elements removed, according to Journal Sentinel reporter Lee Bergquist. Let's hope this turn of events is something that can be built upon, particularly where groundwater is known to be contaminated near rapidly-expanding industrial-scale animal feeding operations under the nose of an intentionally-passive DNR. * A fast-tracked measure passed by the Assembly that would have allowed out-of-state businesses to buy municipal water and sewer systems was derailed in the Senate after statewide uproar. Crucial to the bill's demise was opposition by local governments which have seen a steady erosion across-the-board of their roles by the top-down authoritarians running state government since 2011. Mind you - - I have this in perspective. Programs to reduce phosphorous contamination in waterways - - from state rivers to a Lake Michigan run-off dead zone - - along with wetland and shoreline protections have been ignored or rolled back. As has science staffing and employee/or citizen respect at the DNR, along with assertive pollution enforcement - - even when we're talking about, oh, say, a million gallons of manure. Or more. Wind, renewable and solar programs and projects have been blocked or hamstrung; federal clean air rules are being fought by the administration in court and federal clean water obligations have gone systematically unmet for five years. The DNR waived through a doubling of Superior-to-Delavan tar sand oil piping, and is considering a 26,000 hog farm within smelling distance of Lake Superior in Northwest Wisconsin as well as a high-end golf course that would be built on a wetland-and-forest-rich nature preserve overlooking Lake Michigan adjacent to and intruding within Kohler-Andrae State Park south of Sheboygan. But take some inspiration, and find some useful lessons and allies in a couple of recent wins. You can express opinions and preferences on the proposed I-39/90/94 project using this WisDOT survey tool. The Wisconsin Department of Transportation (WisDOT) is conducting a long-range planning study of the I-39/90/94 corridor between Madison and Portage. A range of concepts are currently being evaluated and we want your feedback. People like to call our state Wississippi as it gets dragged to the national backwaters, but given our atrocious record on race, voter ID, switchblade and gun concealed carry, women's reproductive rights, slashed funding for K-12 and higher ed, repeated ag runoff into nearby wells and a slew of anti-environmental policies and law, when will some other state warn against becoming another Missiconsin, or Wistexas? The various branches of Wisconsin government captured by right-wing interests continue to hand over the environment and public water rights to special interests by: enabling wetland and shoreline development; adding building privileges in rural Dane County; greenlighting water-hogging, polluting industrial-scale livestock feeding operations and sand mining; and, with sweetheart vetting, the doubling of cross-state tar sand oil piping by the Enbridge company (see Kalamazoo River, Michigan, same company and what could go wrong). * A high-end golf course on a 247-acre nature preserve - - official DNR website - - on a bluff above Lake Michigan bordering, and even on several acres within Kohler-Andrae State Park near Sheboygan. More, here. 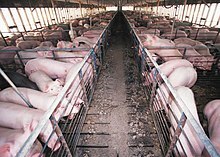 * An animal feeding operation near Lake Superior - - official DNR website - - proposed by Iowa interests to house 26,000 pigs not far from where a West Virginia coal operator wanted to gouge from water-rich hills a 4.5 mile-long, half-mile wide, 700-foot-deep open-pit iron ore mine. More, here. Seems to me that not enough people in the state know enough about The Public Trust Doctrine, and not enough public officials care enough to put it ahead of the special interests which are being allowed to systematically join in its erasure. Plenty of links about the right's attack on the water and land, and the Public Trust Doctrine, here. In other words - - if you love Wisconsin waters, better use the Public Trust Doctrine. And places like Copper Falls. I'm working with my trusty manuremeter to convert those two miles of manure spilled from a mega-dairy in Grant County that reached a trout stream there into gallons to compute a possible fine levied by the guardians of the public's water at Wisconsin Department of Natural Resources. Based on the 2014 Marathon County million-gallon spill that produced a $464 fine, I think we can expect a DNR ticket at least in the tens of dollars. 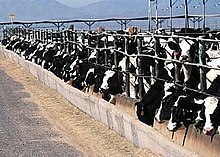 And gives the state's rapidly expanding, manure-spilling mega-dairies so much permanent control over aquifer-depleting well water that the bill's Assembly sponsor, Scott Krug, (R-Nekoosa), voted against it. The bill is just one of many in corporatized. Walkerite Wisconsin where businesses are granted 'certainty' while people living near these big ag operations, or an open-pit iron mine are stripped of the certainty to enjoy fresh water, clean air and peace of mind. If the Senate can get its fast-track machinery in motion, this bad bill will find its way to the Governor's desk for signing, like the shoreline development bill which is on its way today to tie the hands of local governments should they want to prevent the inevitable damage to our one shared environment. [One bill ends] safeguards for about 9,000 water bodies with endangered species and other sensitive features for an indefinite time period. The tradeoff dance between the two houses of the Legislature included the Senate removing - - yea! - - new dredging permissions to property owners, but - - boo! - - expanding the ease with which bodies of water could escape sensitive designations. The Walkerites have been targeting these sensitive waterway designations on behalf of developers for years. And targeting wetlands for insider/developers since Walker's first, January 2011 days in office. Today's the day that the Wisconsin Assembly will likely pass AB 874, a bill to give big ag and the mega-dairies what they are demanding - - permanent withdrawal rights through high-capacity wells to take water without regard to the cumulative effects on neighbors' wells, downstream river flows and any sense of proportion or fairness or environmental sanity when it comes to overseeing the public's waters. Rights to water access guaranteed in the State Constitution - - which the Walker administration has constantly attacked on behalf of its special interest funders. More than 100 Great Lakes cities registered their opposition, and the Political Heat blog has a video. Officials of several Great Lakes states and provinces Wednesday identified Waukesha's future water supply service area as a sticking point in approving the city's request for Lake Michigan water. Though Waukesha says it is scaling back the amount of Lake Michigan water it seeks to divert, and is saving water through conservation, its diversion application will include this report and map showing where outside its current water delivery service territory it could send some of the water. The report and map are required elements of a diversion application under the Great Lakes Compact, and were developed by the Southeastern Wisconsin Regional Planning Commission. Note that some of that acreage is designated by the regional planning commission as environmentally sensitive. Portions of the service territory expansion are undeveloped, and/or are outside the city's municipal boundaries, too. More about the application and tomorrow's Great Lakes regional hearing at Carroll College, here. Though the bill to help out-of-state businesses buy municipal water and sewer systems in Wisconsin had sailed through the Assembly, it appears that outrage statewide has, for now, convinced the GOP-controlled State Senate to shelve the measure. The bill was a sop to one out-of-state business and had no grassroots support in Wisconsin. Props to the organizers and opponents, like Milwaukee Riverkeeper, who backed the State Senate down. But remember - - the industry-crafted iron-mining bill appeared dead before it came back to life prior to the proposed mine's demise - - and yes, the bill is still on the books - - so take nothing for granted when it comes to what special interests expect from their water-carriers in and around the State Capitol. There are one-of-a-kind public events this week in Waukesha on that Wisconsin city's application to a body of eight Great Lakes governors for a precedent-setting diversion of Lake Michigan water beyond the boundaries of the Great Lakes basin, and the return of the diversion as treated wastewater via a river that passes through downstream Racine and its harbor back into the lake. You can read the application and many related documents on a website the Wisconsin Department of Natural Resources has posted on the issue. Among these meetings in Waukesha is a bus tour of the area tomorrow and a public hearing at Carroll College the next day. The hearing will be the sole opportunity anywhere in the Great Lakes region for people to speak in front of these eight Great Lakes states' representatives at one time - - and also to address Canadian provincial officials who have an advisory role in the application's review process - - though the other Great Lakes states, like Minnesota, have already begun holding public sessions to help their governors decide later this year whether to approve or deny the Waukesha diversion application. No water can be diverted and pumped to Waukesha - - its source will be Oak Creek's water utility - - without all eight Great Lakes states' governors voting "aye" on the application under terms of a Compact approved in 2008 by the eight Great Lakes states, and the Canadian provinces of Ontario and Quebec which all share the management of world's largest supply of fresh surface water in the people's interest. The events' schedule will appear at the bottom of this posting: People unable to attend or speak at the hearing can submit written comments through March 14; that timeline and comment procedures are here. The scheduling of these events elevates many environmental, legal, fiscal and socio-economic policy issues that drive and define equity - - and inequity - - and development - - and its distortions - - in SE Wisconsin, and which have been documented across the broader Great Lakes region in a blueprint outlining a fair, and coordinated regional renewal, and which has led to some fine writing in opposition to the proposed diversion. And that lays out some fresh opportunity, if only the Great Lakes decision-makers can grasp it. And the events in Waukesha will coincidentally add context to recent Legislative initiatives and some underway even today at the State Capitol to fast-track the sale of local Wisconsin water and sewer systems to private owners, and to grandfather away permanent access to groundwater by mega-dairies and other big ag users regardless of the impact on nearby wells and other water users. Leaving from Carroll University outside the Campus Center, Waukesha, Wisconsin (Transportation will not be provided to the general public, but the public is invited to follow the main bus). Wisconsin is already selling primo public lands in its 10,000 acre selloff, and just kissed off any coordinated reduction in smokestack gases dirtying up the air - - just as big business asked - - so if and when the Legislature Tuesday hands over to out-of-state companies the right to buy municipal water systems sought by zero such local utilities, and is also poised to permanently grandfather away groundwater supplies to big ag and mega-daries regardless of the cumulative impacts on nearby residents and their wells, the anti-environmental, pro-corporate giveaway trifecta of land, air and water rights will be complete. And remember when candidate Walker accused candidate Barrett of having a "radical environmental agenda?" To please an out-of-state water firm, the WI legislature is poised tomorrow in the face of broad public opposition to make it easier for out-of-state businesses to buy or lease Wisconsin municipal water and sewer firms - - so get ready to add profit for investors and shareholders to your water bill. You don't need no stinkin' clean air plan, Bucky. Or, actually, you're getting a stinky air plan. Either way, I won't say take a deep breath. This blog has been following the proposed conversion of a 247-acre, wetland-rich nature preserve south of Sheboygan into a high-end golf course on a bluff overlooking Lake Michigan - - a plan that naturally raises plenty of questions about the environmental implications for neighbors, the groundwater, the property's already imaired river and Lake Michigan - - but, as the Journal Sentinel is reporting, political appointees running the agency with the "chamber of commerce mentality" Gov. Walker installed there were unhappy that an agency staffer gave the neighbors who inquired under the Wisconsin Open Records law some - - apparently too much - - public information. Yeah, that's a confidence-builder as the agency moves forward with the golf course review - - the developer is a major Walker donor - - and a host of major environmental studies, right? And should we be surprised that an agency led by a corporate ideologue who expressed her open contempt for the employees she was to manage would devalue its workers - - just as it is devaluing the land and water it inherited from administrations past and is supposed to manage in trust for the people of the state?